Home Politics	Howard Shultz, Former CEO of Starbucks, Is Planning To Run For President. Would You Vote For Him? Howard Shultz, Former CEO of Starbucks, Is Planning To Run For President. Would You Vote For Him? Howard Shultz is one very rich man. He’s the man who is behind the rise of Starbucks over the last 20 years. He is also the man who is responsible for Starbucks partners getting their education paid for, stock options, and full health care. Shultz resigned as CEO late last year and then resigned as Executive Chairman of the coffee chain earlier this year citing desires to do more outside of the company. Now, Shultz might be getting ready to launch a Presidential bid. The question now is this: Would you vote for Howard Shultz without knowing exactly what he would campaign on? 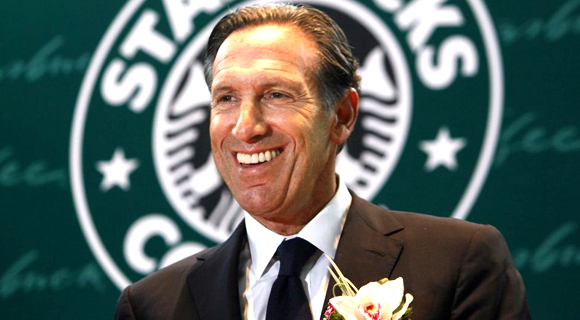 Would You Vote For Former CEO Of Starbucks, Howard Shultz, For President of the United States?